Iñaki Alday (Zaragoza, 1965) is, together with Margarita Jover, the founder of aldayjover architecture and landscape, in 1996 in Barcelona, a multidisciplinary research based practice focused in innovation and in the specific character of the place. 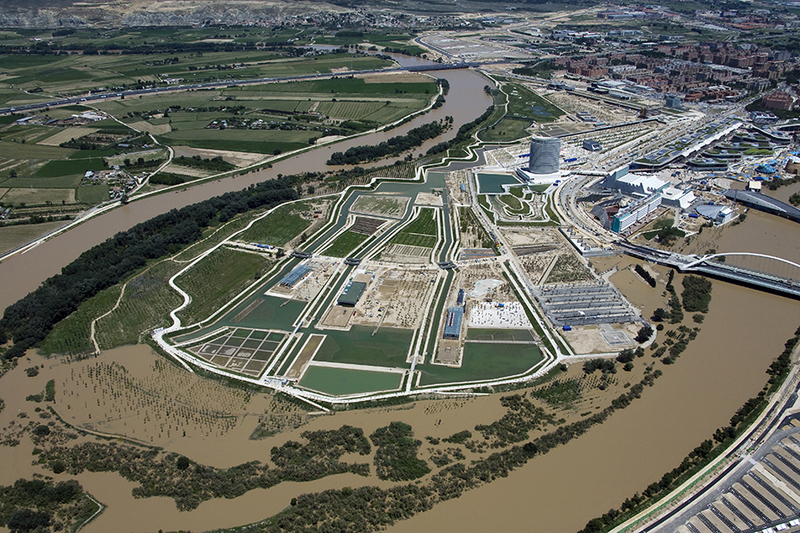 The work is particularly renowned by its leadership in a new approach to the relation between cities and rivers, in which natural dynamics as the flood become part of the public space, eliminating the idea of “catastrophe”. aldayjover has designed some of the most important recent public spaces in Barcelona (Green Diagonal-Sagrera), Zaragoza (Water Park), Pamplona (Aranzadi), or Ibiza (Vara de Rei), as well as architectural pieces and landscapes (The Mill Cultural Center, DHC, or the Recovery of the Gallego river in Zuera). Currently, aldayjover is working in several locations in Spain, South Asia and Puerto Rico, in projects that combine heritage and new buildings, natural dynamics of rivers and public space and social dynamics. As urban experts, the firm is currently working with the World Bank in some of the most acute urban challenges in South Asia and Latin America. aldayjover has been awarded with the European Public Space Prize (2002), the FAD Prize (2009), the Urban Integration (2011), the AZ awards (2015), the nomination for the Mies van der Rohe EU award (2009), and a number of Spanish and Iberian prizes. In 2011, Iñaki Alday was appointed as the Quesada Professor and Chair of the Department of Architecture of the University of Virginia, where he is participating in the on-going evolution of the architecture program at the university of Thomas Jefferson, the one of the first public universities of the United States. Since 2016, he is the Co-Director of the Yamuna River Project (with Pankja Vir Gupta), the first pan-university grand challenge project at the University of Virginia. The Yamuna River Project is a long-term, inter-disciplinary research program whose objective is to revitalize the ecology of the Yamuna River in the Delhi area. The Project involves an interdisciplinary team from the UVa and from India with expertise in architecture, land planning, civil engineering, environmental science, public-private partnerships, anthropology, political science, history, and cultural studies. The team’s objective is to engage the efforts of government agencies, experts and activists in an ongoing program to address the multidimensional challenges of Delhi and the relation with its river. Both in the academic appointment and in the design practice of aldayjover architecture and landscape, Iñaki Alday promotes a new attitude in front of the professional and academic challenges on the transformation of our environment. The role of Architecture and Architects, the interdisciplinary work and integration of scales, the new nontraditional programs as hybrid infrastructures, or the social and environmental ethics are some of the challenges to face with a global vision.